Ole Ole Shopping Centre | Segalanya Di Sini! We have various outlets available for your needs in our shopping complex - Fashion, Cafe & Restaurant, Entertainment, etc. At times we do have great events and promotions for you and your family to enjoy and spend time together. Be sure not to miss them out! Bring along your family and love ones to our shopping complex. Great fun and quality time can be spent together. Ole Ole Shopping Centre is located beside the busy Persiaran Jubli Perak in Section 18 township, and adjacent to the first Giant Hypermarket in Shah Alam. It is surrounded by a fully occupied commercial centre of Section 18. 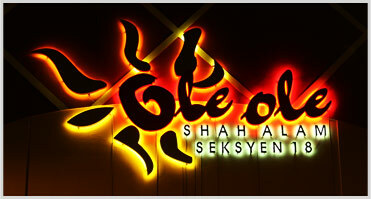 Ole Ole is a 3-storey shopping with a total nett retail area of 90,000 sq.ft. It is supported by about 160 car parking bays, all located at the perimeter of the retail building. The 3-storey Shah Alam shopping complex adopts a community retail centre concept. Its trade mix and tenant mix complements existing Section 18, Shah Alam commercial centre.